If you respect these Thai customs when you visit you will be appreciated by the Thai people you meet. First, the wai – when you meet someone you put your hands together like you would in prayer at chest level and bow your head. You do the same when you say goodbye. 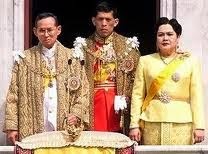 Second, remember that the Thai people revere their monarchy. Don't ever make fun of this or disparaging comments – it's actually a criminal offence to do so. Most buildings will have spirit houses or altars – don't touch them. It is important not to touch anyone's head – that is regarded as offensive. And shoes are not to be worn indoors in private houses or in religious sites. Some traditional restaurants also require shoes to be removed. When you are in a restaurant try not to put your handbag on the floor – the floor is regarded as dirty. In upmarket restaurants women are given separate little stools to put your handbag on. Or you could get a handbag hanger – I bought one not long ago but am not confident that it is really strong enough to hold my handbag – which is stuffed full of stuff! Of course the major highlight of any visit to Thailand is the food! Many of you will know a lot more about Thailand than I do. Please feel free to add your comments. My husband studied abroad in Thailand for a few months and absolutely loved it. He also said something about not showing the soles of your feet in public.